One of the features that you will not find in most Platform as a Service solutions is writing to file system. Writing to file system is very important as you need it in case you want to write user uploaded content to file system, or write lucene index or read some configuration file from a directory. OpenShift Express from the start support writing to file system. In this blog I will create a simple Spring MVC MongoDB application which store movie documents. I will be using Spring Roo to quickly scaffold the application. Spring Roo does not provide file upload functionality so I will modify the default application to add that support. Then I will deploy the application to OpenShift Express. The first step is to create the JBoss AS7 applictaion in OpenShift Express. To do that type the command as shown below. I am assuming you have OpenShift Express Ruby gem installed on your machine. This will create a sample Java web application which you can view at http://movieshop-<namespace&gt;.rhcloud.com. As we are creating Spring MongoDB application we should add support for MongoDB by executing the command as shown below. We don’t need the default generated files so remove them by executing following commands. git commit -a -m "removed default generated files"
Fire the Roo shell and execute the following commands to create the application. Add two fields to Movie entity as shown below. Edit the create.jspx file as shown below to add file upload as shown below. Modify the MovieController to write file either to the OpenShift_DATA_DIR or my local machine in case System.getEnv(“OPENSHIFT_DATA_DIR”) is null. The code is shown below. Also change the show.jspx file to display the image. Finally change the webmvc-config.xml to have CommonsMultipartResolver bean as shown below. Change the applicationContext-mongo.xml to point to OpenShift MongoDB instance as shown below. OpenShift applications require maven profile called openshift which is executed when git push is done. This entry was posted in cloud and tagged mongodb, openshift, spring-mongodb, spring-roo on February 20, 2012 by shekhargulati. How MongoDB Different Write Concern Values Affect Performance On A Single Node? In the first post I talked about how indexes affect the write speed in MongoDB. In this second post I will share my findings on how different write concerns affect the write speed on a single node. Please refer to the first post for the setup related information. A write concern controls the behavior of write operation and gives developers the choice to choose the value matching their requirements. For instance there are some documents which are not very important and if one of them get lost your business will not get screwed. For those you can choose less stricter value of write concern and for objects where you want don’t want your object to be lost you should choose stricter value of write concern. Let’s take a look at different write concern values available in Java driver. Please note in this experiment I used MongoDB java driver 2.7.2 instead of Spring MongoDB. Normal : This is the default option where every write operation is fire and forget which means it just writes to the driver and return back. It does not wait for write to be available in server. So, if another thread tries to read the document just after the document has been written it might found not find it. There is a very high probability of data loss with this option. I think this should not be considered in cases where data durability is important and you are only using single instance of MongoDB server. Even with replication you can loose data with this option (I will talk about in my future post). None : This is almost same as Normal with just one different that in Normal if network goes down or there is some other network issue you get an exception but with None you don’t get any exception if there are some network issues. This makes it highly unreliable. Safe : As suggested by name it is safer than the above two. The write operation waits for the MongoDB server to acknowledge the write but data is still not written to disk. With safe you will not face issue that when another thread tried to read the object you just wrote, the object was not found. So, it provides a guarantee that object once written will be found. That’s Good. But still you can loose data because data is not written to disk and if server died for some reason data will be lost. Journal Safe : Before we talk about this option. Lets first talk about what is Journaling in MongoDB. Journaling is a feature of MongDB where a write ahead log file of all the operations is maintained. In scenarios when MongoDB is not cleanly shutdown like using kill -9 command the data can be recovered from Journal files. By default data is written to journal files after every 100 milliseconds. You can change it to lie between 2 ms to 300 ms. With version 2.0 journaling is enable by default on 64 bit MongoDB servers. With Journal Safe write concern option your write will wait till the journal file is updated. Fysnc : With Fsync write concern the write operation waits till the data is not written to disk. This is the safest option on a Single node as only way you can loose data is when the hard disk crashes. I have left the other values which are not applicable to single node but make more sense when replication is enable. I will cover them in future posts. The test case was very simple I will be doing 1 million writes with each of options except fsync and will find out the writes per second speed for each of the write concern values. The document is similar to the one used in first post. It is 2395 bytes. The JUnit test case is shown below. In each test case it inserts one million records with a different value of write concern. As you might have also expected Normal and None are the fastest because of the way they work i.e. fire and forget. Safe writes takes 3.5 times more than Normal writes. With Journal safe value you come down to 24 documents per second which is very low. As you can see as you move towards more write safety you loose a lot on write speed. This is again a decision you have to make depending on your use case. Can something be done to increase write speed in Safe and Journal Safe options? The results shown above are based on records being inserted sequentially one at a time. I tried an experiment where in I divided 1 million records to a batch of 100,000 records each. And let 10 threads write 1 million record in parallel. The write speed for Safe and Journal Safe increased but None and Normal decreased as shown below. The write speed for Safe with 10 threads is 1.4 times the write speed with one thread and similarly write speed for Journal Safe is 10 times of the write speed with one thread. This is because while one thread is waiting other threads can work in parallel which allows to better utilize CPU. This entry was posted in nosql and tagged java, mongodb, spring-mongodb on December 8, 2011 by shekhargulati. How MongoDB write/read speed varies with or without index on a field? Last 3 weeks I have been busy working on a PoC where we are thinking of using MongoDB as our datastore. In this series of blog posts I will be sharing my finding with the community. Please take these experiments with grain of salt and try out these experiments on your dataset and hardware. Also share with me if I am doing something stupid. In this blog I will be sharing my findings on how index affect the write speed. I will be inserting 60 million documents and will be noting the time taken to write each batch of 10 million records. The average document size is 2400 bytes (Look at the document in under Document heading). The test will be run first without index on the name field and then with index on the name field. Write speed with index dropped to 0.27 times of write speed without index after inserting 20 million documents. Dell Vostro Ubuntu 11.04 box with 4 GB RAM and 300 GB hard disk. Spring MongoDB 1.0.0.M5 which internally uses MongoDB Java driver 2.6.5 version. The documents I am storing in MongoDB looks like as shown below. The average document size is 2400 bytes. Please note the _id field also has an index. The index that I will be creating will be on name field. Developer. I am a Java Developer. " The first JUnit test inserts 10 million record and after every 10 million records dumps the time taken to write batch of 10 million records. Perform a find query on an unindexed field name and prints the time taken to perform the find operation. This tests runs for 6 batches so 60 million records are inserted. logger.info("Total Time Taken to do a find operation "
In the second test case I first created the index and then started inserting the records. This time find operations were performed on the indexed field name. + " batch of Records in milliseconds : "
logger.info("Total Time Taken createIndex "
WriteConcern value was NONE which is fire and forget. You can read more about write concerns here. After running the test cases shown above I found out that for the first 10 million i.e. 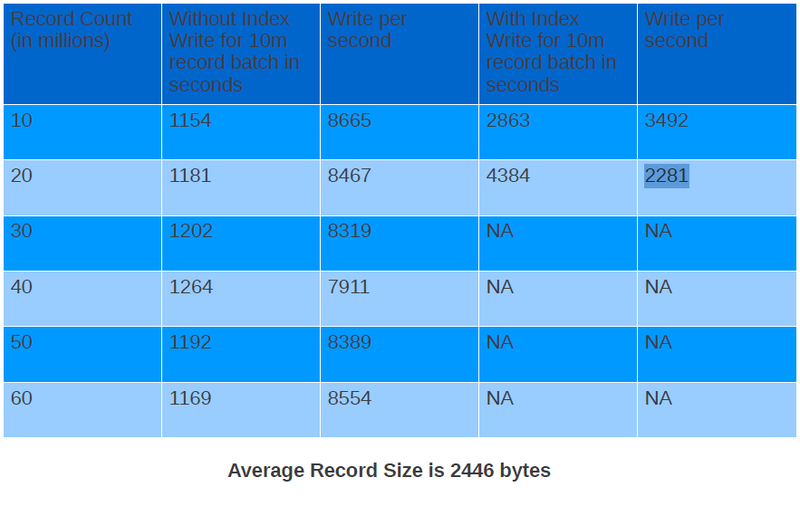 from 0 to 10 million inserts write per second with index was 0.4 times of without index. The more surprising was that for the next batch of 10 million records the write speed with index was reduced to 0.27 times without index. Looking at the table above you can see that the write speed when we don’t have index is remains consistent and does not degrades. 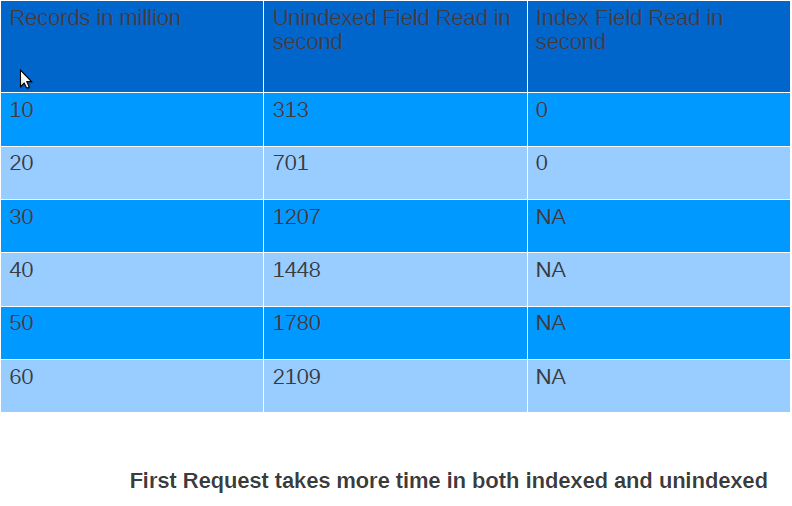 But the write speed when we had index varied a lot from 3492 documents per second to 2281 documents per second. I was not able to complete the test after 20 million as it was taking way too much time to do next 10 million. This can lead to lot of problems in case you added index on a field after you have inserted first 10 million records without index. The write speed is not even consistent and you have to think of sharding to achieve the speed limits you want. Read results don’t show anything interesting except that you should have index on the field you would be querying on otherwise read performance will be very bad. This can be explained very easily because data will not be in RAM and you will be hitting disk. And when you hit disk performance will take a ride. This is what all I have for this post. I am not making any judgement whether these numbers are good or bad. I think that should be governed by the use case, data, hardware you will working on. Please feel free to comment and share your knowledge. This entry was posted in java, nosql and tagged java, mongodb, spring-mongodb on December 3, 2011 by shekhargulati.